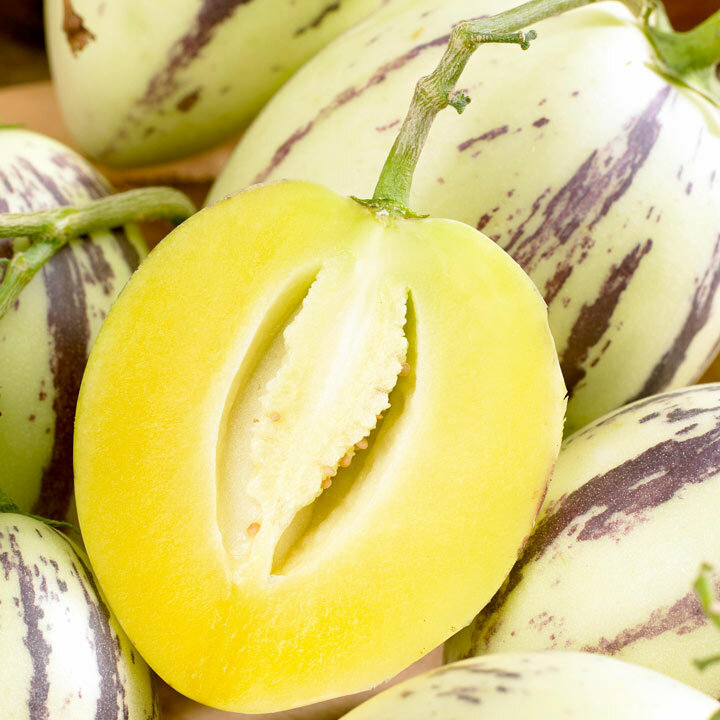 The fruits have a mild fruity taste, like a cross between melon and pear, with a slight freshness of cucumber, perfect to snack on their own, but great to add to fruit salads and normal salads. You'll be best to grow them in the hottest place you can, so a greenhouse or conservatory is ideal, but they will also be happy on a hot, sunny patio. If you bring them indoors for the winter you can enjoy a tasty harvest year after year. Pepino love water, so make sure they are constantly moist. It has a great tropical look and taste of the fruit, its a fantastic showpiece in the conservatory. Grows to 90-120cm (3-4'). 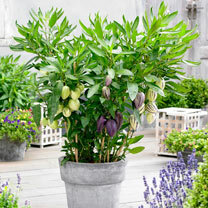 Supplied as three plants (each having a distinct coloured fruit), growing in a single 14cm pot. Pepino likes to be grown in moist soil, so do not let the soil dry out. The plants need as much sun and warmth as you can give them. 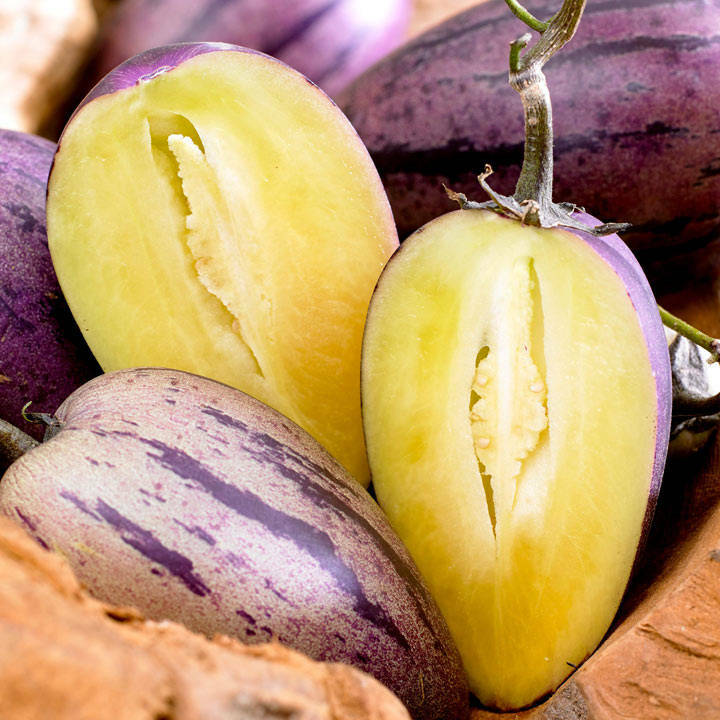 The fruit is ripe when the yellow/gold ones develop purple streaks and begin to soften. After the fruit has formed, leave the best 1-2 fruit on each of the 3 plants and remove the rest. Purple fruits will soften and become darker. It is normal for some leaves to drop during the year, and to overwinter keep the plants inside and warm (a sunny windowsill is perfect). Plants can be pruned to 30cm tall to overwinter, if a smaller sized plant is needed, it will then begin to shoot in the spring. For fruit to ripen, plants must be kept in a warm and sunny place. The plant will set fruit once the nighttime temp reaches 13-15°. Can be grown as an annual or half-hardy perennial if given winter protection. Self-pollinating. Grow like a bush tomato. When fruit begins to swell, the branches may need some support. Increasing the fruit's exposure to sunlight improves the purple striping on the fruit. Plants will survive temperatures down to 0% for short periods, however, they may lose most of their leaves. If kept too cold, the plants may die back, however, they should grow back from the base provided they are mulched well. Bring inside when the temperature begins to drop, cutting back to around 30cm (12") tall (leaving the fruit to ripen). 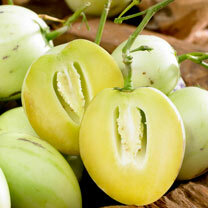 Feed weekly with tomato food once the fruit form. Can be eaten raw in fruit salads or as you would a melon, but also works well sliced in half and cooked on a BBQ. 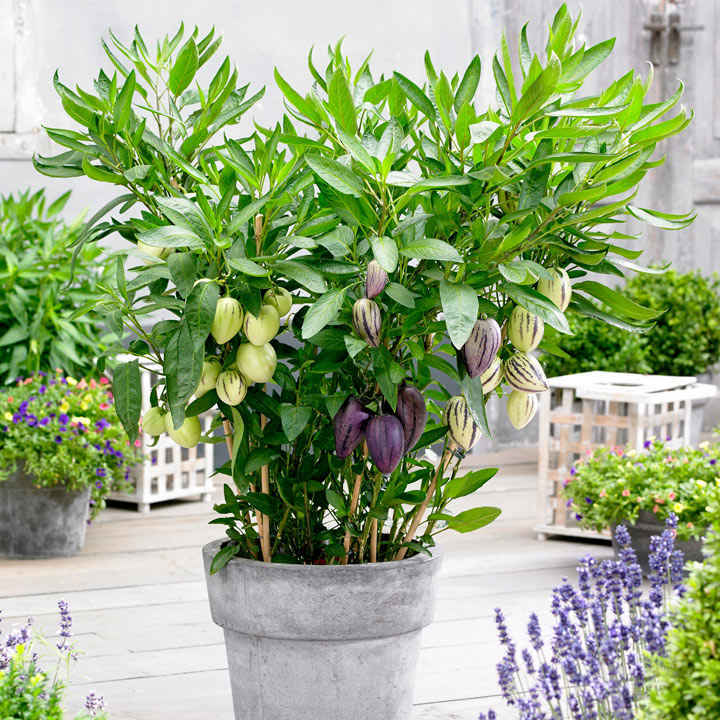 Grows best in a greenhouse, conservatory or indoors, but can be grown on a hot sunny patio.